About two feet tall, the bronze statue of the goddess is modelled after the Statue of Liberty. 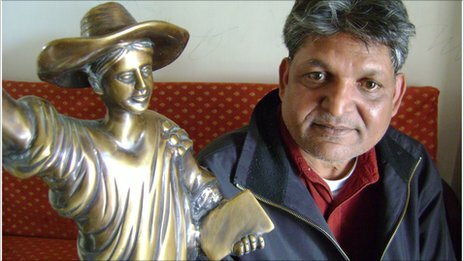 "She is the symbol of Dalit renaissance," says Chandra Bhan Prasad, a Dalit writer who came up with the idea of the Goddess of English. "She holds a pen in her right hand which shows she is literate. She is dressed well and sports a huge hat – it's a symbol of defiance that she is rejecting the old traditional dress code. "In her left hand, she holds a book which is the constitution of India which gave Dalits equal rights. She stands on top of a computer which means we will use English to rise up the ladder and become free for ever." There could have been a black temple here. The entrance might have said ‘Paradise Lost’ after John Milton’s poem about man’s disobedience and ouster from the Garden of Eden. Milton intended the poem to justify the ways of God to men. There was no justification intended here. The temple was meant to celebrate the outcastes, the fallen—Paradise Lost would be a refuge. Within its walls, Dalits would chant ‘ABCD’ and solve mathematical equations. They would denounce other gods and goddesses who perpetuate caste barriers. The goddess wore a hat, a gown, and had gold hair. She looked like a Statue of Liberty knock-off. Chandra Bhan Prasad, the man who created her, says there were modifications made to give the new goddess her own mythology. The Goddess of English held a keyboard and a pen. She was atop a computer on the screen of which was the chakra of the Buddhist faith. She also held the Constitution of India to cement her bond with the Dalit community because Dr BR Ambedkar, the Dalit scholar and leader, was its founding father. Why was the temple to be black? Because people would have found it strange. It would provoke reaction and this goddess was all about reactions. Black is seen as evil. The goddess would redefine black, give it sanction, says Bhan. This was Paradise Lost. They would regain it. But nothing happened. The English goddess went as suddenly as she came. The goddess came but only just. After the first day, she was stacked away in the office of the headmaster and for a few days, remained there in hiding. The district administration shut the temple down because, it was rumoured, Mayawati, then Chief Minister, had said there could only be one Dalit goddess in the state. Bhan wrote to the administration asking for a reason and was told there was a Supreme Court directive that no temple should be built on public land without permission from the administration. The goddess was transported to the house of the school owner in a nearby town. There she remains, hidden away till she can be installed once again. The expensive black granite that was bought for construction of the temple lies around unused. Rain pours down, washing away the dirt, and the stones glisten again. A dog seeks shelter in the old office from the rain. This is where the goddess had been moved after the police came to Banka and ordered that construction be stopped. This is another great, albeit far-out, example of what our incredible language means to people from all walks of life who would find their rightful place in the world… the language of Liberation! Viva l'Anglaise!! All she needs is an appropriate name. Gwendoline? Muriel? Penelope? Jemima? Millicent? Or perhaps Victoria? Hattie? (after that Huge Hat). "Henrietta" on public holidays. Fer cryin' out loud! Am I— (probably not)— the only one whose first reaction is fury against the district administration for, it seems, trying their damnedest to keep the Dalit down? Norma Loquendi? (If she's a chaste goddess.) Albiona? The English word "Goddess"? After reading Chinki Sinha's writeup, I'm sincerely impressed by Bhan's proficiency in the little-analyzed art of godsmithing. But of course, if she stays on top of a monitor (one of those CRTs, rhight? It's extremely hard to stay on a flatscreen unless you actually stay on the liquid crystal panel) she must be named Ada or maybe Grace (Hopper). Grace is actually a nice name for a goddess. Political Science's Devesh Kapur examines Dalit entrepreneurs"
The second article mentions that "She was atop a computer on the screen of which was the chakra of the Buddhist faith." I wonder how this goddess of English will fit into the Buddhist religion of the Dalits. Laura Mipsum (until the name's decided). Historically some of the big proponents of fluency in English as a path toward equality within modern India have been the L1 Dravidian-speakers well to the south of U.P., as in http://en.wikipedia.org/wiki/Anti-Hindi_agitations_of_Tamil_Nadu#Agitation_of_1965. Whether those people would find common cause with these goddess-worshippers (given that the politics of caste are no doubt complex throughout India, and the dynamics probably vary from place to place) is not clear to me. Piotr's suggestions for characteristically "English" names for the goddess are, tellingly enough (whether it's ironic is left as an exercise for the reader . . .), almost all loanwords (from variously Greek, Hebrew, Celtic, and Romance sources) if you go back far enough. Alas, few families these days give their daughters unambiguously Anglo-Saxon names like Frideswide or Etheldreda. But then that's what modern English is: the sum (and synergy) of such influences. She's a goddess of English, not Old English. Such a reaction will be surprisingly immature, and will completely miss both the context and the situation. First a few facts. Discrimination against Dalits is not only unconstitutional, it is also a criminal offense. Further, Mayawati, the politician referred to in the piece is one of the most influential politicians in India, and also a "Dalit" women Unlike many other influential Indian politicians, she is also "self-made" in the sense of not coming from any well-connected political family: she started her career as a school-teacher. At the time the story happened, she also happened to be the Chief Minister (equivalent to a Governor in the US) of Uttar Pradesh, India's most populous and politically most important state (it contributes the largest number of seats to the national parliament). Mayawati has also done her bit for Dalit empowerment, and indeed her own story has been a shining beacon for caste equality in India. However, Mayawati also happens to be have for what appears to be a somewhat narcissistic streak. For example, while she was a chief minister, she allowed the installation of her own life size statues along side statues of other Dalit icons like Gautam Buddha and B R Ambedkar. This is a big no no in most Indian cultures (statues are typically only made of dead people), and was a cause of much ridicule and criticism (also because she used public money for the statues). It also lead to some unsavory incidents later (with one group "beheading" one of her statues when she was not in power; this was however promptly corrected by the party in power). The bit aboute "only one Dalit goddess in the state" is apparently a reference to this. Tl:DR: No district administration in North India, especially Uttar Pradesh, would ever try to "keep the Dalit down". Not just because it would be morally, ethically and legally wrong, but also because there are enough Dalits in the higher echelons of administration to make sure there are consequences for such bigotry. Actually, much of the popular sentiment in India is very much against the "incredible language". While it is true that a knowledge of English is seen as an enabler, there is also a lot of resentment over what appears to be an emphasis on English skills over everything else. To take a recent example, just a few weeks back, there were huge protests against an English language requirement in a test meant for selecting upper level civil servants. The protesters claimed that Hindi and other Indian languages were not getting there due, and that the emphasis on English was favoring those from urban backgrounds over those from rural ones. The government had to agree to remove the controversial portions from the test. See here. Piyush: Do you have any idea why the police would have prevented the building of the temple on private land (if Bhan's story is true)? Incidentally, I joined in the name suggestions because I feel that a transparent name such as "Dalit Goddess English" or "Angrezi Devi" is unbecoming to a deity, though I suppose the Greeks had Selene and Helios—and many English speakers have God. I do not know any more about this particular case than what the article by Sinha says, but it hints very strongly that this was due to pressure from Mayawati (the then Chief Minister of UP, and a formidable Dalit icon herself) who did not want any new "competitors". The district administration shut the temple down because, it was rumoured, Mayawati, then Chief Minister, had said there could only be one Dalit goddess in the state. Sorry, somehow my reply got posted twice, and once under the name of Jerry Friedman (to whom I was replying). I thought it was clever of me to answer myself without knowing it! The comment about Mayawati looked to me like a joke mocking her, not a serious claim that she was responsible, but maybe I misunderstood. Jerry Friedman: Actually, Mawawati is well known for not tolerating any other "power centers" in her party; it would entirely be "in character" for her to try stopping someone or something else from becoming a competing Dalit icon. On the other hand, she was also known for not tolerating any civil servants who deviated from her policies, especially if she thought that they were discriminating against Dalits in any way. I have first hand experience of living in Uttar Pradesh while she was in charge, and no district level administrator who tried to "keep the Dalit down" without either a sound legal reason or, at least, an indirect sanction from Mayawati, would have been able to keep her job. I own a house and land in San Diego. I would be honored to give the Goddess a safe place to stand. I'll bet I'm not the only one. Mayawati could choose among us, or . . .
Piyush: Thanks for answering my question.